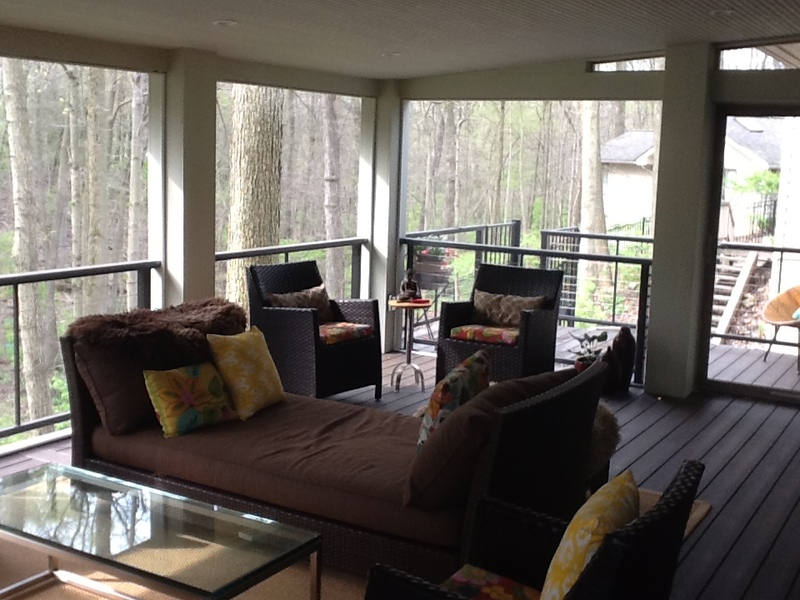 What flooring option should you use for your Columbus screened porch? One of the most important decisions associated with designing and building a porch is picking the best flooring material for your project. That decision will determine many of the deck’s fundamental qualities including how much it will cost, how long it will last, how it will look and how much maintenance it will require. That many how, how, hows can make the choice a little intimidating, but we’ve put together a quick primer on the most common porch flooring options in Central Ohio. The first option, of course, wood. It’s been used as a building staple for hundreds of years. It’s relatively inexpensive, depending on the type of wood you use, and very easy and quick to build with. We primarily recommend using pressure-treated pine flooring. Sun is wood’s worst enemy and the porch roof removes that problem from the equation. Any wood may be sealed or stained to increase its durability and longevity. 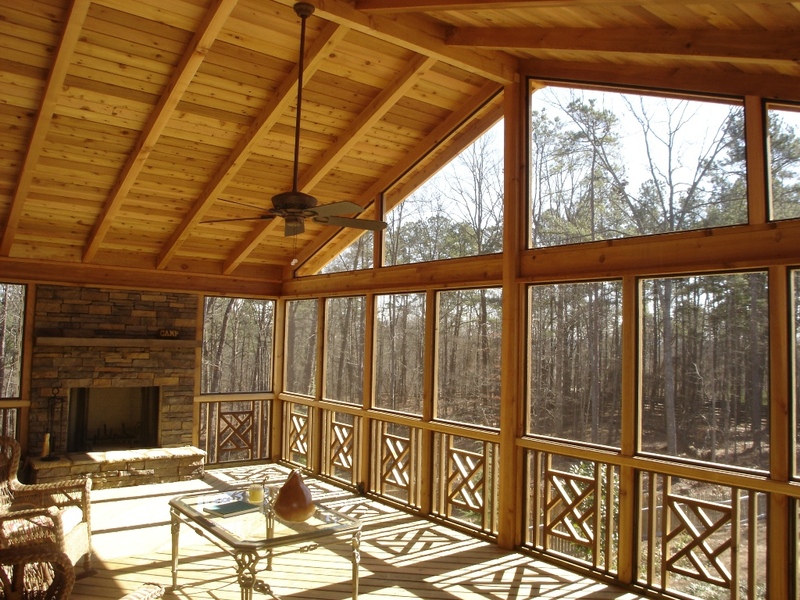 If you don’t care for the look of pine, you can easily upgrade to another type of wood like ipe or cedar that may better complement the style or color of your home. The area immediately under the floor will be lined with screening to impede bugs from becoming the unwanted visitors on your porch. 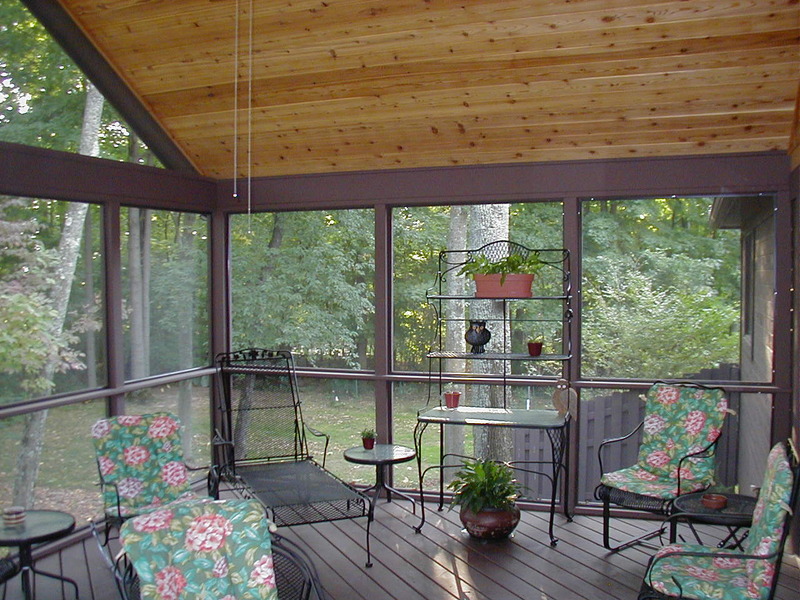 Synthetic deck planks are often chosen for projects where the porch adjoins to an attached deck so that the material is consistent all the way across. This isn’t necessary, as we can easily create attractive transitions, but some clients prefer a homogeneous, pulled-together look. These low-maintenance floors are extremely durable, much more hardy than the sealed pine, so they are especially resistant to scratches from pets or moving furniture. You may hear synthetics referred to as PVC or composite flooring or by a trademarked name like TimberTech. Tile is a material we don’t suggest because of the weather in the Columbus area. If you’ve lived here for more than a couple years, you understand the freeze/thaw cycle that we experience each winter. The only way we could lay tile would be over a full concrete foundation, similar to one used for the main house. Even then, the open air of the porch leaves both the tiles and the grout subject to significant stresses. Tile has been used locally, but I wouldn’t choose it for my home. Concrete or stained concrete would offer similar challenges to tile and we don’t recommend their use for the floor of a screened porch. Pavers are an option for porches that are low to the ground or nearly flat to grade. They are hardy enough to endure through very harsh weather and are available in a variety of shapes, design layouts and colors; so they are very flexible in terms of style. Regardless of the flooring you choose for the base layer, you can always dress your floor up with carpets or throw rugs. If you have an especially large porch, you can use rugs to visually define distinct living areas. Rugs are incredibly versatile in terms of size, shape and color and can be easily swapped out for a new look seasonally or annually if you want to freshen up the style of your porch. Rugs can be made of a wide variety of natural or synthetic materials, many of which are weather resistant. One parting thought: flooring doesn’t need to match the ceiling, walls, screens or other wood treatments. It’s a stand-alone design element. Think about how you will use your new space and let that drive your choice. If you have any questions about flooring options or other outdoor living project topics, please give us a call. We are happy to share our knowledge and experience. Contact Archadeck of Columbus today to see how we can make creating your dream backyard an enjoyable experience, start to finish. The consultation is completely free. (740) 879 – 3730 or email us at westcolumbus@archadeck.net. We look forward to your call.